I’ve never been a breakfast guy. I’ve always preferred to use those calories to enjoy a bigger lunch. Lunch has always excited me more. That, or I’m generally just not hungry in the mornings. I also hated waking up before sunrise to work breakfast shifts in my past life as a line cook. Maybe that is why I have yet to feature a morning spot in my column. This entry will change that. 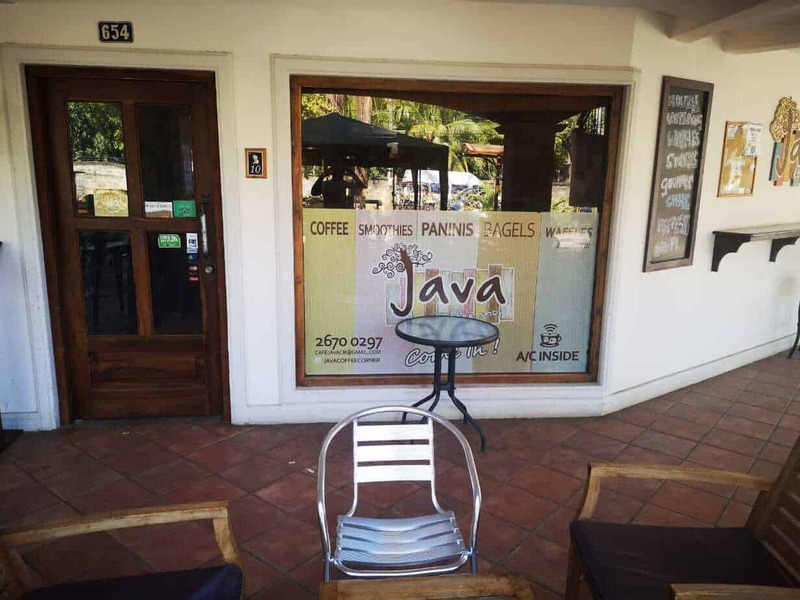 For the first time ever, I present to you: Java Coffee in Playas Del Coco. Just in time for those of you planning to spend Semana Santa in Guanacaste. This is a great place to start your day. The smell of locally roasted coffee beans and freshly toasted bread hits you when enter the door. You also get a refreshing smack of air conditioning to the face. It’s always been a welcome exit from the scorching Guanacaste sun for me. I love this spot. As I said, I don’t usually have much of an appetite first thing in the morning. But when I do, I always get their Egg Muffin sandwich (3,000 colones / $5). It’s like McDonalds one, but with more love. 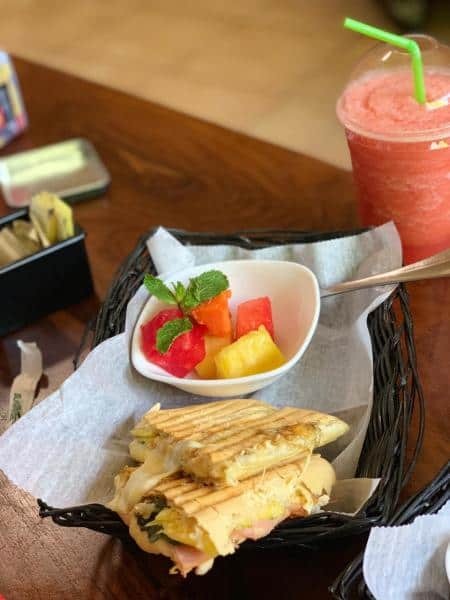 The Hawaiian panini (4,000 colones/$6.60) is another go-to. It’s stuffed with sliced ham, mozzarella cheese, fresh pineapple and basil. It’s melty and gooey and delicious. But normally, for me, it’s just a cup of Brumas de Zurqui coffee. The beans come from a farm in Heredia, Costa Rica and the coffee has won awards for its quality. *At an additional cost, of course. Java Coffee is famous for their house-made, Belgian style waffles. They serve them with berries, whipped cream and maple syrup for a cost of 3,700 colones ($6.14). My girlfriend usually orders these and I have stolen my fair share of bites, so I can confirm the hype. Their menu is written in chalk, covering a whole wall inside the restaurant. They also serve a variety of bagels, paninis, salads, fruits and milkshakes. Everything has a notable emphasis on being healthy and local, which I support. 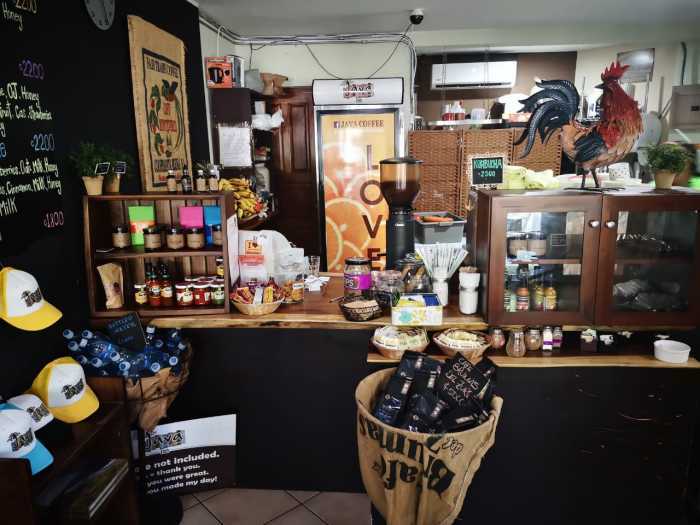 You can also buy a variety of locally produced artisan goods, such as sauces, salts, elixirs and hats. The service is always incredibly friendly and is usually very efficient. But sometimes, if you visit during peak hours, it can be a little slow. This is a small spot and normally only has two or three staff working, which can be insufficient when 20 people show up to order at the same time. So, be patient, you might have to wait a bit. You’re at the beach anyway and the pace of life is slower. Enjoy their great soundtrack of music – and free WiFI – while you sit. 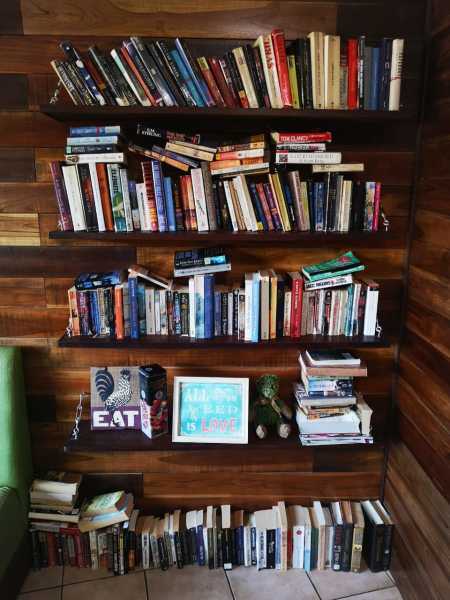 Or, grab a book from their community trust library system (take one, leave one style bookshelf). Afterwards, I like to walk across the street and relax on the beach which is only about 100 meters away. It’s really my ideal morning. Java Coffee is open seven days a week, from 7:00 a.m. to 5:30 p.m. So you could pass by for lunch or a late afternoon coffee. Java Coffee shop originally opened in 2012 as Java Café, but has recently rebranded to Java Coffee Shop aka Java Coffee Co. The “co” stands for corner. It’s a nod to their location in the corner unit of El Pueblito Norte, a commercial plaza located along La Chorrera in the Las Palmas area of Playas Del Coco. Prices include tax. Major credit cards are accepted. Pets are welcome. Vegetarian options are readily available, as are private parking spots directly in front of the business.